Sleep is a hot topic right now, with everyone from Arianna Huffington to Nobel Prize winning scientists sharing their stories, findings and insights about the benefits of good quality rest. This is hardly surprising given that the latest research suggests the quality of your sleep doesn't just leave you feeling more energetic and less likely to reach for that morning coffee, but can have a huge impact on your performance and your mood, as well as your long-term health. However, just like eating healthily, taking more time to relax and exercising regularly, it's easy to say you want more sleep. But how can you improve the quality of your rest and begin to make those all important changes? We spoke to Hannu Kinnunen, Chief Scientist at Oura Health, about the science behind your sleep and how to use the Oura ring to unlock the secrets of better slumber once and for all. "Our sleep patterns and biological rhythms are at the very core of our well-being," Hannu Kinnunen, Chief Scientist at Oura Health told us. The problem is, identifying those rhythms and patterns isn't always easy on your own. This is where the Oura ring comes in. This simple and stylish wearable doesn't just track sleep. Instead, it keeps tabs on all kinds of physiological data, from your night-time temperature and resting heart rate to the steps you've taken. "Night is the mirror of the day: basically everything that happens in our bodies while we're awake is reflected in our sleep and recovery," Kinnunen explained. "And similarly, good sleep quality and recovery help us to take on new challenges, and make the most of our awake time." This is why it's important to use Oura to paint a holistic picture of our overall health and well-being all day rather than just focusing on one or two factors. But unlike other products on the market, it doesn't only present this data in graphs and charts. It also recommends how you can make changes that are personal to you, right now. "Oura provides scientifically validated sleep data and valuable information on your body recovery status, like heart rate variability, resting heart rate and body temperature in such an effortless way – and even interprets the findings to daily recommendations," Kinnunen said. There's plenty of generic sleep advice wherever you look, from your GP's waiting room to glossy magazines. But what the Oura ring does well is teach you about your sleep patterns, which means it's easier to make conscious changes. One of the most valuable findings when it comes to better understanding your sleep is whether you're an early bird or a night owl. "Understanding your morningness or eveningness, which is called your chronotype, can help you to adjust your lifestyle in a way that helps you to stay balanced and healthy," said Kinnunen. Although pressures of our work or social lives can mean some days we go to bed later or wake up earlier than others, most of us will be predisposed to feeling more energetic at a certain point during the day. The Oura ring can help you decipher when that is, which then means you can change your routine to better accommodate it. 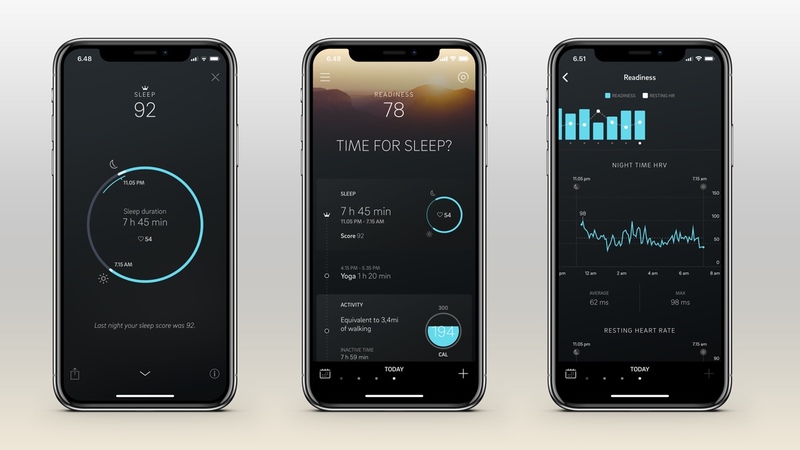 Among the many new features in the recently launched new Oura app is the 'optimal bedtime window', a tool that's easy to understand and enables users to better get to grips with their chronotype by suggesting when they should hit the hay. This recommendation is based on a huge range of data, including personal sleep patterns and physiological responses tracked over weeks and months. "If you're a morning person, your optimal sleep schedule is earlier than for an intermediate or an evening person," Kinnunen told us. "If you're a night owl, your daytime performance can benefit from sticking to a regular but a bit later rhythm. It is pretty straightforward that finding a stable sleep schedule that works for you is the key to improved daytime performance." Figuring out whether you're an early bird or a night owl is just the tip of the iceberg when it comes to better understanding your personalised sleep patterns. "Our bodies and minds need restorative, deep sleep to recover and develop," Kinnunen told us. "Whether it's exercising or learning new things, the efforts we put in our daily activities will only really start to pay off when we find our optimal schedules for doing things, and make time for a good night's sleep the following night." Kinnunen explains that in order to get restorative sleep, we should aim to live in sync with our circadian rhythms, also known as our internal clocks. The problem is, no one person's internal clock is the same. In the same way people are different heights or weights, we all have slightly different internal clocks and chronotypes. This means you need to track the way you sleep, eat and move in order to better understand your own rhythms and energy levels, as well as how to optimise them. Kinnunen uses a fitness example to show how you can use data from the Oura ring to make changes to your habits. "After seeing how exercise at different times of the day affect your night-time sleep quality and heart rate variability (HRV), you can plan your daily schedule better," he told us. "Personally, I get increased heart rate variability and more deep sleep (which are both good) after an intensive morning exercise while I get lowered HRV after an intensive evening exercise," Kinnunen explained. "After using Oura I now know how to plan my training schedule according to my ability to recover." It's all well and good talking about personalised sleep patterns and being a night owl. But how can we use this data to take action and make big changes to our sleep? Kinnunen believes the first step is awareness. "We know we should exercise regularly, eat healthy, unplug from technology in the evening and get 7-9 hours of sleep," Kinnunen told us. "In practice though, it's often not until you really see your own data and body reactions that the change starts to take place. The effect is a lot stronger." The next is committing to making changes over a period of time and really caring about the patterns and effects. More than anything, Kinnunen was keen to talk about the importance of consistency. It's easy to follow all the good sleep 'rules' for one or two nights in a row, but he reminds us that "a stable sleep pattern in the long-term is the key to improved health and daily performance." Once you're armed with long-term data, you can start making connections between your behaviour and your sleep. Kinnunen told us: "Becoming aware of how your night-time heart rate, heart rate variability, body temperature and sleep quality are affected by a late-night workout or late screen time can eventually lead to new, healthy habits or routines that stick." "We've seen examples where people have started to adjust their sleep schedule after seeing the effect staying up late and sleeping in on the weekends can have on their recovery and sleep," Kinnunen told us. "The effect can last for several days!" There's also a lot to be said for realising just how important the final few hours before bed are. Kinnunen says better understanding the affect night time routine has on sleep has been "a game changer for many Oura ring users." "For some it can mean less caffeine (already afternoon coffee may count) or skipping a nightcap, for others taking a light evening snack instead of a heavy meal," he told us. "Seeing how these small changes reflect in your sleep quality is typically where good sleep and good recovery begin." Whether you're a great sleeper and an early bird or struggle to fit in enough zzz's and consider yourself a night owl, there's plenty you can learn with the Oura ring about the way you sleep and how the way you live, your habits and behaviours affect the quality of your rest - and vice versa. Great article. love this "Night is the mirror of the day"